PAPA ROBBIE.NET: FINALLY!!! Someone with a heart!!! I just bought a bunch of Starbury clothing & shoes myself and plan to buy plenty more. 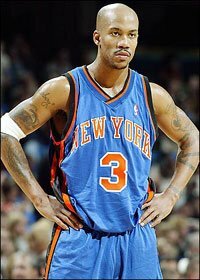 Stephon Marbury is doing the right thing and I hope more athletes and entertainers would get the intestinal fortitude to do the same thing. Click on the Starbury link to learn more. Stephon Marbury does not ride a horse throughout the countryside yelling about guys in red coats. Stephon Marbury does not make impassioned pleas about liberty or death. Stephon Marbury merely came up with the idea of selling high-quality sneakers and apparel for less than $15. However, in a world where youngsters have been convinced that any sneaker worth wearing has to cost almost as much as a monthly car payment, Marbury's concept could be the shot heard 'round the world. This New York Knicks point guard/revolutionary is bringing his $14.98 Starbury Ones basketball sneakers around the country during a 42-city, 17-day tour. The two-time NBA All-Star says he will be wearing Starbury Ones when he plays in the coming season. "My first home game I'm going to go to the store and pick up a pair of shoes and bring them to the (Madison Square) Garden and lace them up and play in them," he said. Marbury says Starbury Ones have the same quality leather and construction as the sneakers NBA legend Michael Jordan and other basketball stars have turned into a near necessity of urban childhood. Ironically, the man behind the Jordan marketing is Erin Patton, who is now helping Marbury develop his line. In fact, Marbury was one of those youngsters growing up in the public housing projects in the Coney Island section of Brooklyn, N.Y., who could not afford the $150 sneakers marketed to those who could least pay for them. Nothing in his Starbury clothing and shoe line, sold exclusively at Steve & Barry's stores, costs more than $15. The 29-year-old basketball star and father of three can now buy anything his family wants, but he still remembers the times when he couldn't. "I know how hard my mother had to work for the little bit she had," said Marbury, who was the sixth of seven children in his family. "I wouldn't even ask my mother to buy me some $200 shoes. Being in the NBA and being able to provide for my family is a beautiful thing." He believes that his sneaker revolution can help young people and their parents to be educated consumers. His line includes leather jackets for $10, hats, hoodies, jeans and jean jackets and a variety of sneakers. The clothes and sneakers in his line are the same exact stuff, he said, as the lines that cost much more. He created the line with Steve & Barry's, which was founded in 1985 at the University of Pennsylvania to offer items found at the campus bookstore for much lower prices. After expanding to other university campuses around the country, it branched out to other casual apparel in 1998. Asked how he can sell his items at such an unheard of price, Marbury simply states that it cost less than $14.98 to make them. Steve & Barry's also cuts costs by doing no advertising, relying heavily on word of mouth. Marbury said his clothing line "is creating a positive flow of energy for people to feel good about themselves," he said. And that positive attitude is flowing right back to Marbury during his tour. He said one woman, a mother of eight, called him her hero because finally she was able to buy her children all something at one time. "I created the tour because I wanted people to really understand we're not just doing this for money," Marbury said. "Sure, it takes money to do what we're doing, to travel, stay in hotels, but it's not about the money. It's about basically showing the love. "This is not about basketball," he continued. "Everything we're doing is motivated by us, just being a group of people who feel it's time for change."